On this date in 1938 Austrian Chancellor Kurt Schusch­nigg arrived in Salz­burg for a quick trip over the German border to confer with Adolf Hitler at his Bava­rian Alps resi­dence above Berchtes­gaden, the Berg­hof. An Austrian native who had served as a lance cor­po­ral in the Bava­rian Army in World War I, Hitler had been granted German citizen­ship in 1932. The following Janu­ary the Nazi Party leader was appointed Chan­cellor of Ger­many. In 1934 Schusch­nigg suc­ceeded to the top post in Austria after Chan­cellor Engel­bert Doll­fuss had been mur­dered in a failed coup d’état by mem­bers of the Aus­trian Nazi Party, a party that was secretly funded by the German Foreign Office in Berlin. Chancellor Schuschnigg’s clandestine meeting with his German counter­part on Febru­ary 12 was any­thing but plea­sant, Hitler in­sulting the Aus­trian leader and raving at one point: “I have only to give an order and your ridicu­lous de­fenses will be blown to bits!” Hitler gave the Aus­trian chan­cellor a dead­line of Febru­ary 15 to resign in favor of Aus­trian Nazi Party leader Arthur Seyss-Inquart, whose party Dollfuss had banned, jailing many of its members. Once safely back in Austria, Schuschnigg reor­gan­ized his cabi­net, brought in repre­sen­ta­tives of former polit­i­cal parties (some banned), and worked against German machi­na­tions. He called for a March 13 nation­wide plebis­cite to demon­strate Aus­trian resolve against German coer­cion, poli­tical or other­wise, believing that Hitler would not risk an inter­na­tional inci­dent. The day before the sched­uled plebis­cite German troops marched into Aus­tria. 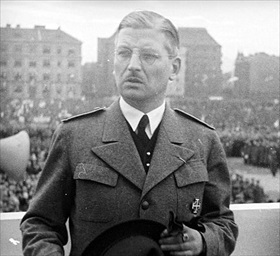 Schusch­nigg was arrested (he and his wife were even­tu­ally sent to Sachsen­hausen, then Dachau con­cen­tra­tion camps in Germany), and Aus­trian Nazi Party leader Seyss-Inquart named him­self both chan­cellor and presi­dent of Austria, despite the refusal of the sitting presi­dent, Wilhelm Miklas, to resign his office. Hitler crossed the border shortly after­wards, wel­comed by thun­derous crowds, some celebratory scenes genuine, some staged. April 10 sham plebiscites in both countries showed 99 per­cent supported the Anschluss, or union with Germany. (British intel­li­gence, on the other hand, esti­mated that not more than 35 per­cent of Aus­trian voters had cast their ballots in favor of Anschluss.) After the elec­tions Austria became known as Ostmark, “the Eastern Region,” and was fully incor­porated into Greater Germany (Gross­deutsch­land), a dream Hitler had laid out in his muddled, frightening blueprint, Mein Kampf (My Struggle), in 1925. 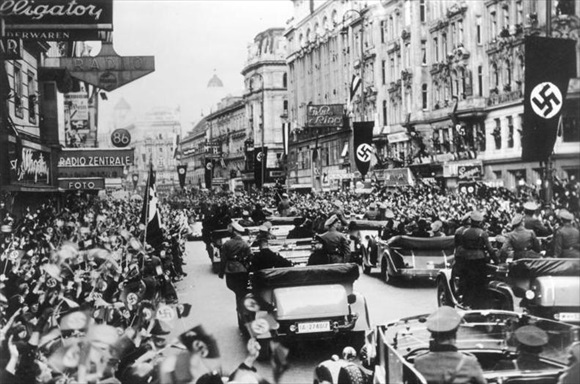 Above: Hundreds of thousands of Austrians lined the streets as Hitler and his entourage made a triumphal entry into Austria’s capital, Vienna, on March 14, 1938. 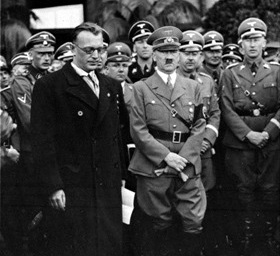 Left: Austrian chancellor (1934–1938) and Father­land Front leader Kurt Schusch­nigg at a party rally, 1936. Schusch­nigg rejected Hitler’s Pan-German politics; in­stead, he focused on pro­tecting Aus­tria’s inde­pen­dence during a decade of poli­tical un­rest in Central Europe. After the war and his release from German captiv­ity, Schusch­nigg emi­grated to the U.S., where he taught poli­tical science at Saint Louis Uni­versity in Missouri from 1948 to 1967. Schuschnigg returned to Austria where he died in 1977. Right: Nazi Reich Governor Arthur Seyss-Inquart with Hitler in Vienna, 1938. During their February 1938 meeting at the Berg­hof, Hitler bullied Schusch­nigg into appointing Aus­trian Nazi Party leader Seyss-Inquart to head Aus­tria’s Ministry of Public Security, a post that gave Aus­trian Nazis full and un­limited con­trol of their country’s police forces. With the assis­tance of Seyss-Inquart’s post-Anschluss puppet govern­ment, the Nazis quickly embarked on a cam­paign of repres­sion and terror. Tens of thou­sands of Aus­trians, including Catholics, Social Demo­crats, Socialists, and Com­munists, were arrested and sent to concentration camps.